| NEW YORK, NY - August 2, 2018 | Designer Aimée Wilder teamed up with 7TILL8, a custom surf wetsuit brand, to bring her Jungle Dream and Mushroom City patterns to life. Wilder’s wetsuit comes in Mushroom City, made out of Yamamoto neoprene and with her design which features myriad fungi at fluctuating heights, creating a dense sea of organic structures and hidden fauna. 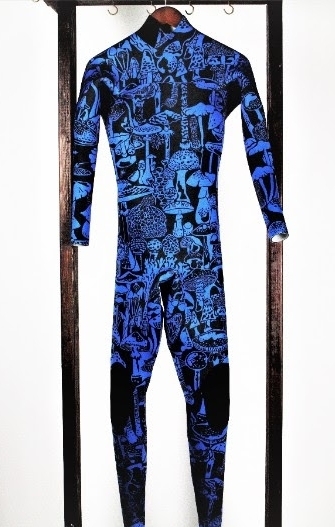 The Jungle Dream wetsuit is for fiancé Stewart Armstrong, also made out of Yamamoto neoprene and designed with Wilder’s dreamy landscape of wildcats, lumbering sloths, and playful primates filling up a sleepy jungle. Both will be on display @aimeewilder on Instagram as she travels this summer to Ireland, Scotland, Portugal and the sunny beaches of Southern California, as well as at next year’s Long Beach Scuba Show. Wilder was born and raised in New York and graduated from the School of The Art Institute of Chicago in 2001. She has held positions as a designer for several iconic firms including DwellStudio, Martha Stewart Living, and The Gap. Transfixed by the world of textiles and design, she launched her namesake wallpaper brand at New York’s ICFF in 2009 after her first fashion licensing contract with Vans in 2008. Known for bold designs and a playful aesthetic, Aimée Wilder has expanded its line to include home textiles and handmade rugs, as well as accessories such as pillows and poufs.